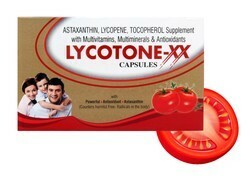 Antioxidant With Lycopene, Methylcobalamine & Astaxanthin Complex, offered by us is a preparation intended to supplement a human diet with vitamins, dietary minerals and other nutrients. Multi-mineral is vital than a multivitamin. These tablets provide 100% benefits and fulfill the nutrient requirements of the body. 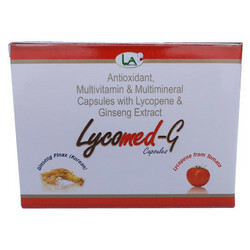 ANTIOXIDANT Capsules of Lycopene 6000mcg and Korean Ginseng with 20% Ginseosides. Ginseng is a normalizer, energizer, and stress reducer. It benefits both low and high blood pressure, energizes those suffering from fatigue, and helps calm those prone to stress or nervousness. It improves mental clarity and memory, enhances physical stamina, and bolsters the immune system. It can normalize blood sugar in type 2 Diabetes. It is considered a general tonic, strengthening the heart, spleen, liver, lungs, kidneys and pancreas, thereby improving overall health and prolonging life, which makes it something of an anti-ageing herb.